Whether mentoring a future Hall of Famer or helping a prospect change positions, George Kissell compiled a string of impressive successes as a minor-league manager in the Cardinals system. On May 4, 2015, Kissell was elected to the St. Louis Cardinals Hall of Fame, along with outfielder Curt Flood, pitcher Bob Forsch and catcher Ted Simmons. 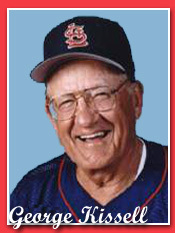 Kissell worked in the Cardinals organization from 1940 (when he started as a player in Class D) until his death at 88 in 2008. He was a Cardinals coach from 1969-75 and a longtime instructor. He also managed Cardinals minor-league clubs from 1948-57 and 1961-68. Earl Weaver, the St. Louis native who was elected to the National Baseball Hall of Fame after managing the Orioles to four American League pennants and a World Series championship, played three seasons for Kissell in the Cardinals’ organization. A second baseman, Weaver, 19, hit .276 with 20 doubles in 127 games for a 1950 Winston-Salem team managed by Kissell. Winston-Salem won the Carolina League championship with a 106-47 record, finishing 19 games ahead of runner-up Danville. In 1951, Kissell managed Weaver at Omaha. Weaver hit .279 with 35 doubles in 142 games. Omaha won the Western League title with a 90-64 mark and Weaver was named to the league’s all-star team. Kissell and Weaver returned to Omaha in 1952. Weaver hit .278 with 15 doubles in 97 games. Omaha finished 86-68 under Kissell. Weaver played in the Cardinals’ system from 1948-53. With three consecutive seasons playing for Kissell, it’s reasonable to assume the lessons and fundamentals Weaver learned from Kissell helped him become one of the game’s best managers. Ken Boyer began his first two minor-league seasons, 1949-50, as a pitcher in the Cardinals’ organization. During the 1950 season, he converted to a third baseman. In 1951, Boyer, 20, played his first full season as a third baseman for an Omaha club managed by Kissell. Boyer hit .306 with 28 doubles and 14 homers in 151 games, launching him on a path that would lead to him winning five Gold Glove awards and a 1964 National League Most Valuable Player Award with the Cardinals. When Boyer missed a few games with Omaha because of an injury, Kissell, 30, filled in for him at third base. Playing for Kissell with the 1957 Winston-Salem team, Gene Oliver, 22, established himself as a Cardinals power-hitting prospect. Oliver, a first baseman and catcher, hit 30 home runs, breaking the Winston-Salem club record held by Steve Bilko. Two years later, Oliver was called up by the Cardinals. beginning a 10-year career in the major leagues, including four seasons with St. Louis. After the Giants released minor-league third baseman Coco Laboy, he was signed by the Cardinals. Playing for Kissell at Raleigh in 1964, Laboy revived his career, hitting .340 with 29 doubles and 24 home runs in 112 games. Chosen by the Expos in the 1968 expansion draft, Laboy was the starting third baseman for Montreal in its first two National League seasons, 1969 and 1970. In 1967, Kissell managed a pair of teenagers in their first year as professional players: Simmons, 17, and pitcher Jerry Reuss, 18. Simmons was selected by the Cardinals in the first round of the June 1967 draft; Reuss was a second-round choice. The first place the Cardinals sent them was to their Gulf Coast League club managed by Kissell. Simmons hit .350 in six games for the Gulf Coast League Cardinals. He would go on to a 21-year big-league career, collecting 2,472 hits and 1,389 RBI. Reuss was 0-0 with a 5.14 ERA in two appearances for Kissell’s team. Reuss would go on to a 22-year big-league career, earning 220 wins.